Born and raised in Las Vegas, Catherine Cortez Masto has spent her career fighting for Nevada’s working families. She served two terms as Attorney General of Nevada and, in November 2016, became the first Latina elected to the United States Senate in U.S. history and the first woman from the State of Nevada in the Senate. 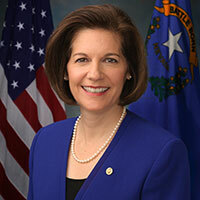 During her time as Nevada’s top prosecutor, Cortez Masto became well known as an advocate for seniors, women, and children. She worked closely with local law enforcement to keep Nevada’s communities safe, fought to protect Nevada’s public lands, and developed a task force to safeguard Nevada’s seniors from exploitation. In the wake of the housing crisis of 2008, Cortez Masto led the fight to hold the big banks accountable for their role in the housing collapse and secured a $1.9 billion settlement for Nevada homeowners. Now as a member of the United States Senate, Cortez Masto has taken her fight for working Nevadans to Washington, D.C. Cortez Masto remains a strong advocate for women and children, and she believes that all Americans have the right to affordable, accessible health care. An avid hiker and nature-lover, Cortez Masto is committed to protecting our environment and public lands for future generations to enjoy. She is fighting to repair our broken immigration system, pass comprehensive immigration reform, and protect hardworking families from deportation. Cortez Masto currently resides in Las Vegas with her husband, Paul.